Because She's Not Just Sniffing--She's "Pulling A Trixie"
But I would have gladly traded every surprise lily in the yard for the chance to catch Cary yesterday morning with giant pink petals hanging out both sides of her rapidly munching little mouth. Another priceless moment. Unfortunately this was one of the rare times I didn't have my camera. Trust me, it was a riot. A year of Daily Photos ago: The Homemade Swing makes its first appearance. You posted this only moments before I signed in. 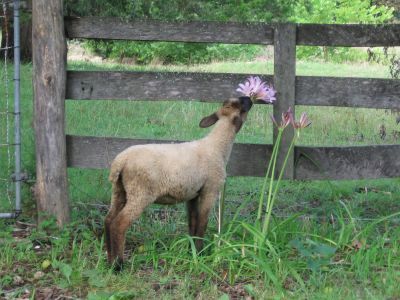 That "little" lamb is not so little anymore! Have a great evening FG! Sometimes you can just have too much pink in the garden. 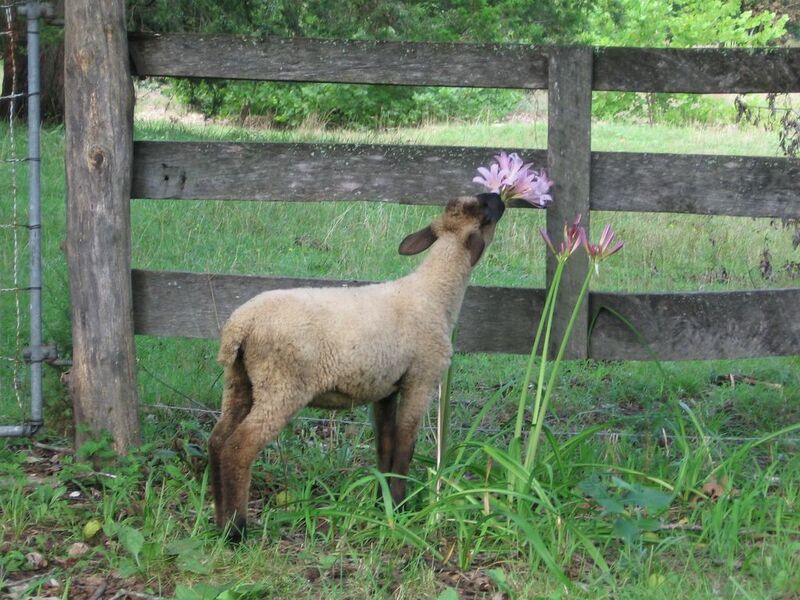 I had to laugh, there's just something so biblical about a sheep considering the lilies of the field! Oh that pic of Cary made my day! Clearly, she is sniffing as well as munching...the girl is an epicure. Carrie is Busted!!! LOL! That is a darling photo. The scene that you described sounds funny, too. I stumbled across your blog and love it! It reminds me of growing up in Iowa, where we had a gorgeous garden and a few wandering flower eaters of our own. (Suffolk & Hampshire) Ironically, my name is Susan and I now live in California. I sure hope those pretty pink petals aren't poisonous! Lovely pic once again. Am smiling just imagining Cary with all those flowers in her mouth!! i'm married to a city boy so i may have to live vicariously through your farm blog, cause he wants to be where the action is! little does he know the action is with the donkeys and sheep! first time visiting your blog, i'll be back. Aha! I love a good Cary post. Thank you for sharing her little moments with us Susan. Have a wonderful day. Awwww. That Cary is just adorable. Cary has such good taste! I would have loved to have seen a picture of her devouring the evidence!! 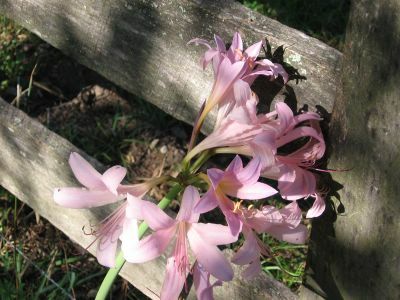 Hi fellow Missouri farmgirl, those pretty pink lillies you mentioned are called " naked ladies", cuz they have no leaves. They are in full bloom down here too! Where are located? Love your blog! I love visiting your site and today I found out that my lilies were in bloom too. Since yours were, I looked in the woods where they're hidden and there they were. Yahoo. Thanks again for sharing your farm with me. I just love visiting it, it's so peaceful. See! Now I really wish Cary lived closer! We have those things springing up in the most annoying places and have to dig them out of the ground to get rid of them. For the record, my Kansan husband calls them Naked Ladies even though I grew up calling them Pink Ladies. Apparently there's some sort of coastal disparity. In central florida we call them rain lilies, mostly because they tend to show up when the rain does. My mom's best friend had them all over the yard when I was little. So beautiful. Thank you for your stories. I live in the country now but not farming... yet. Cute picture. 240 acres would be paradise. And anyone who digs them up to get rid of them send them to me....Where are you located in Missouri? I am outside Kansas City.